Theater and drama are tools to change the community and inspire youth and kids to be changemakers. Arts in general can be used to build sustainable communities, through empowering young people who can make a difference in their local communities as they always trying to develop creative and sustainable solutions to the challenges of their daily life. One of the very few social enterprises in MENA (Middle East and North Africa) region, named Yes Theater has worked exclusively with children and young people using theater and drama as a tool to raise awareness and advocate for improving community issues. Mohamed Issa, half Palestinian / half Jordanian, studied chemical engineering in 2002, at Najah University in Palestine, obtained his master degree in International Cooperation and Development from Bethlehem University in 2012, worked as program manager at World Bank for 4 years since 2004, where he was responsible for providing quality management systems and curriculum development services for Palestinian universities. Mohamed co-founded Yes Theater (YT), in 2008 with a group of co-founders who spent eighteen years implementing drama and theater projects and programs with youth inside and outside schools, in cooperation with the Palestine ministry of education. Mohamed says “The Palestinian community is suffering from many different social challenges”. He adds “we use drama and theater to build sustainable communities and empower youth and kids to be change-makers who can face their daily lives challenges with creative and sustainable solutions”. Yes Theater main tools to build the sustainable communities and empower youth to be changemakers are artistic performances specially speaking to the issues relevant to the Palestine society, drama workshops and theater performances, capacity building for teachers in theater based techniques, advocacy plays and activities of culture exchange. Annually they reach to 30,000 youth and kids, and over than 100 teachers. Mohamed says “When children and youth join Yes Theater, they grow up in many ways”. He adds that “they amplify their voices, and leverage their influence and power as actors of social change and development”. Yes Theater is located in Palestine and has more than 16 theater productions. YT’s activities operate through three main programs: Drama 4 All, Yes 4 Youth and Yes 4 Future, where they either are teaching drama for teachers or youth, or creating drama plays with social messages. 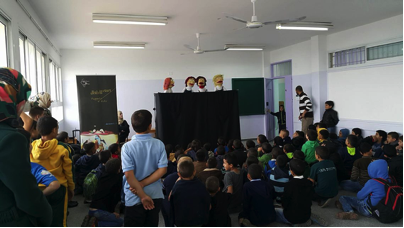 Mohamed has founded a new social enterprise under the umbrella of YT, named Puppets 4 Kids where they are performing different plays with puppets that has social messages, the programs is targeting only school’s kids. Creative use of resources brings hope for the future of humanity. The WASTE BIN TO LIVING ROOM program is an initiative of two young businesses in Uyo, Akwa Ibom state, Nigeria which helps in providing jobs to young unemployed while cleaning up the city's waste. The founders Mr Itohowo Inyang, a trained art sculptor and Mr. Akanimo Akan, a microbiologist / corporate communicator found a way to combine working in sustainability and creative metal fabrication. Sustainable economies, inclusive societies and clean energies are recurrent topics, and bringing it to reality will certainly be a major challenge for current and future generations. Teun, a Dutch engineer and founder of the The Solly System, developed a didactic toy-robot-system that operates with an interactive software designed to help children understand how renewable energy works. I came up with this idea because of a strong desire to solve the needs of the communities in remote rural areas of Uzbekistan that experience shortage of energy resources. The households in many rural areas use energy resources mainly for cooking and heating. My invention is a low cost sustainable solar cooker and heater that will serve as an alternative source of energy for rural low income families. From Ideation to sustainable organizational transformation! There are many different success stories about young Egyptians that managed to pass hard times in their life and be successful in their professional careers, or who have helped their communities by starting successful developmental organizations. The best opportunities come once in a life; only those ready to jump on it, will take it! When it comes to moving day, for every student it is a nightmare that never ends. That is the time when you wish you haven’t bought that big sofa or haven’t taken your grandpa’s wooden desk. In case you are wondering if there is an alternative to massive furniture here is the answer: cardboard! The Co-working spaces concept started in the United State (US) in 2005 in San Francisco, followed by Europe in 2012 in the United Kingdom (UK). The co-working concept is spreading all over the world, making it hard to determine who was the pioneer that took serious steps to start the first co-working space in the MENA region, but nowadays there are many co-working spaces in different countries and cities, starting with Egypt, Cairo (District , 302Labs , Almaqarr , Ice Cairo , Rasheed22 , QafeerLabs), but also Morocco, Casablanca (New Work Lab ), Lebanon, Beirut (AltCity , Coworking+961 , Beirut Digital District), Dubai (Impact Hub Dubai , Make business hub , Pavilion Downtown Dubai , Shelter ), Jordan, Amman (Oasis500), and Kuwait (Sirdab-lab ). If you ask yourselves how bad pollution is in China, I will give you the short answer: it is awfully bad. That bad that the term “airpocalypse” has been especially coined in 2013 to describe the quality of air in Beijing. That year, the World Health Organisation has measured 40 times more hazardous particles than it would be safe for human beings. As the sun sets, Shama Bibi switches on her solar lantern and starts sewing clothes for the upcoming festival of Eid. Not long ago, she used to sit idle as soon as darkness sets in. She and other residents of her village outside Bahawalpur, now also remain busy in their activities after sunset. This might not sound like a big deal to someone living in a developed country. But in the far off villages of Pakistan, however, where people barely have access to electricity, these solar lanterns are truly a blessing. Sustainability is everywhere, at least many of us do agree now it should be embedded within industry activities and so on. But a field which is almost unexplored and underdeveloped at the moment is the greenness of services we use every day. Software, cloud services and applications do not have green standards or labels. Plastics are bad for the envirnment, we all know that. One of the things hardly ever thought of though, but also harmful, are the toxic dyes used for the plastics.